CIT Electrotechnology is a three storey educational facility with an additional upper level plantroom area. Externally the building has imposing enclosed stair structures with a two storey high raised entry and Alucabond sunshade structures. Luxalon and custom orb cladding complimented with extensive double glazed windows gives the building a very sharp appearance. Internally the use of face block, plywood wall panels and baffle grid ceilings give an industrial look and expose services for teaching purposes. Incorporated into the building are classrooms, workshops, office areas, break out spaces, store rooms and conference facilities. 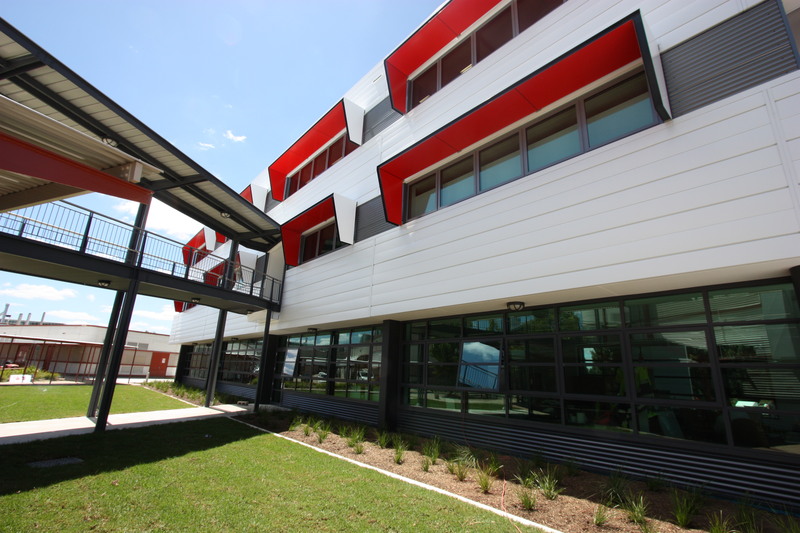 The project team worked extensively with the Canberra Institute of Technology to ensure the new state of the art facility was provided with both new and existing joinery, furniture and equipment to meet the specific teaching requirements of the end Users.